Defence Secretary Gavin Williamson has outlined the global role of the UK’s Armed Forces and defence industry after leaving the European Union and beyond in a speech at RUSI today. The Defence Secretary acknowledged that the UK faces a world of competing powers, hostile states and stateless ideologies, who are happy to operate in a ‘grey zone’ between war and peace. He claimed it is crucial that Britain’s Armed Forces and defence infrastructure are ready to meet these challenges and do not stand still as the world moves forward, making a raft of announcements to support that goal. The UK is a global power with truly global interests. A nation with the fifth biggest economy on the planet. A nation with the world’s fifth biggest Defence budget and the second largest Defence exporter. And since the new Global Great Game will be played on a global playing field, we must be prepared to compete for our interests and our values far, far from home. To support this aspiration, the Defence Secretary announced new strategic assets that will allow Britain to meet the global challenges the future might hold. Two new Littoral Strike Groups are to be created. Complete with escorts, support vessels and helicopters, one would be based to the East of Suez in the Indo-Pacific and one based to the West of Suez in the Mediterranean, Atlantic and Baltic. To compliment these groups, there will be a Warfighting Division with troops able to deploy from our bases at home and in Germany. This will all ensure we have a global force, capable of deploying around the world in a matter of days. This ability to remain a global force and to protect the UK at home and abroad depends not only on personnel but also the equipment they rely on. 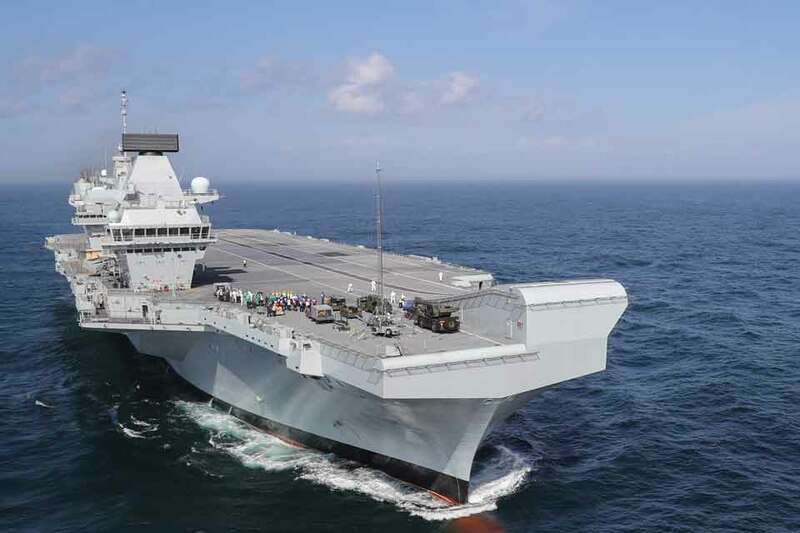 The Defence Secretary announced that HMS Queen Elizabeth’s first operational mission will include the Mediterranean, Middle East and the Pacific. She will have British and American F35s embedded in her air wing, enhancing the reach and lethality of our forces. Defence Secretary Gavin Williamson today announced the first operational mission of HMS Queen Elizabeth. Crown Copyright. The RAF will also grow the number of Typhoon squadrons from five to seven - equipping them with world leading radar and upgraded deep strike Storm Shadow cruise missiles. This is vital following the recent retirement of the Tornado jet, proving that the UK is still committed to defending ourselves and our allies across the world. Embracing new technology, the Defence Secretary also committed to use the Transformation Fund to develop swarm squadrons of network enabled drones capable of confusing the enemy and overwhelming their air defences. The Defence Secretary concluded by highlighting that Britain has always been an outward looking nation. Faced with our adversaries upping their spending and investing in technology, the Armed Forces must respond by strengthening our global presence, as well as enhancing our lethality and increasing our mass. The full speech is available here.